LG is launching 12 HDTV lines at this year's CES – 30 new LCD models and seven fresh plasmas, with screens as small as 19 inches and as gloriously large as 60. Many of the new HDTVs are a proving ground for LG's latest technologies. For example, the flagship 55-inch LHX model is less than one-inch thick – 0.97-inches to be precise. The LHX is also wireless. Along with the new LH85 series HDTVs, the LHX features Wireless HDMI technology. Video signals (up to full 1080p) are broadcast to the TV from a separate media box. While it doesn't eliminate the power lead, you can wave goodbye to unsightly HDMI cabling. The LHX is one of several models to features LED backlighting. LG's backlighting technology reportedly creates a dynamic contrast ratio of 2,000,000:1 (with intelligent dimming), while TruMotion 240Hz technology cries 'death to flicker' and smooths out any fast moving images. Many of LG's new HDTVs also feature four 'Core Technologies'. The first of these is an invisible speaker system, custom tuned by audio expert Mark Levinson. AV Mode II is next. It's essentially three preset AV Modes – cinema, sports and game – that are included to help users optimise picture and sound settings to suit whatever they are watching/playing. Clear Voice II technology is the third Core Technology, automatically enhancing dialogue when the volume of background sounds rise. Finally, the Picture Wizard enables easy self-calibration by providing on-screen reference points for black level, colour balance, tint, sharpness and backlight levels. 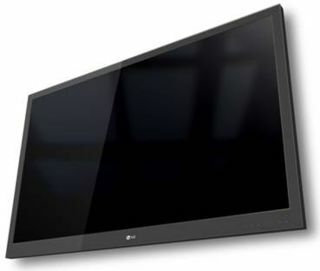 The LH50 and PS80 series HDTVs offer what LG calls NetCast Entertainment Access. Blessed with Ethernet ports, the TVs can run the Yahoo! Widget Engine to access selected web content, watch YouTube videos and stream content from Netflix (US only). Want a full run-down of LG's new models? Take a deep breath and browse the specifications.